Lena’s musical experience covers much ground; growing up playing trumpet in The Cactus Channel, playing piano in contemporary jazz ensemble Lazercatz 2000, keys in electro-pop outfit Tetrahedra and vocals in art-rock eight-piece Tulalah. She has toured Australia with Killing Heidi, No Zu, Bec Sandridge and Ryan Downey and plays in Melbourne with SPIRE Ensemble and Dance Party. 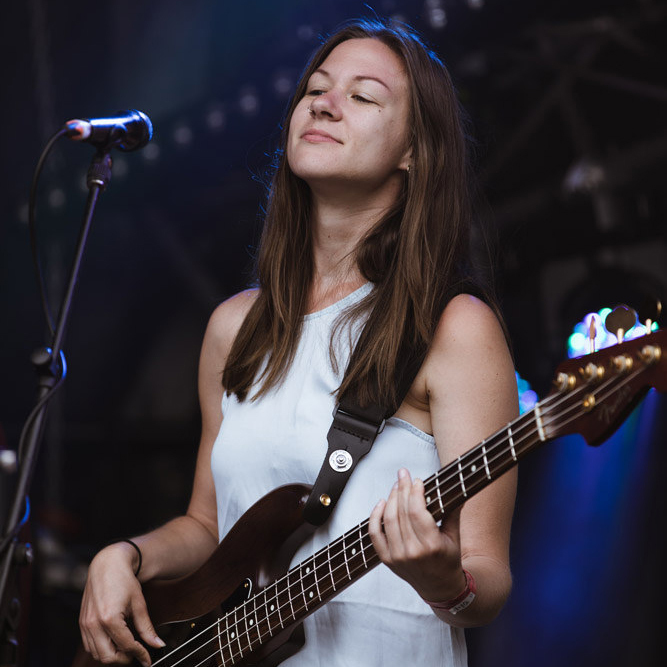 Over the past 10 years, Claire has carved out a career for herself as a well-respected bassist and composer, having worked with numerous artists including The Outdoor Type, Oh Pep!, and the Her Sound, Her Story project (Ella Hooper, Julia Stone, Vera Blue, Montaigne, Airling, Sampa the Great). She has written and released music with improvised jazz-rock ensemble 'The SURFACE Project', and has presented performances including Bjork: Interpreted, Stand By Your Woman (SPIRE Ensemble) and Moving Targets. Through her elegant fusion of R&B, disco, soul and electronica, rising Melbourne artist Francesca Gonzales has been captivating audiences with triumphant live shows and potent hooks. Exploring themes of empowerment, strength, love and independence, her new self-titled EP is a tour de force which showcases her adventurous sonic aesthetic and incredible vocals. The EP’s anti sexual harassment anthem ‘Baby Give It Up’ and previous single ‘Better Person’ were added to Double J and Unearthed, as well as receiving strong community radio support and a slew of effusive reviews. Elsewhere, opening track ‘Make My Life Slow Right Down’ perfectly captures the wooziness of finding new love, while ‘Halfway Hall’ is a moving, gospel-infused ode to the importance of loving yourself. The snaking bass lines and meticulous production at the heart of next single ‘Dilemma’ evoke the experimental R&B of FKA Twigs or Kelela. Liv is generally known as the front woman of Oh Pep!, a band she’s been touring the world with since 2009. Her work has been featured in the New York Times and Rolling stone, on NPR’s Tiny Desk and the stages of Glastonbury. She has toured with the Mountain Goats, Billy Bragg, Lake Street Dive, Nathaniel Ratliff, Lord Huron, Valerie June and Martha Wainwright, plus some more! In 2017, Liv began a community driven project called FUN, facilitating collaborative songwriting opportunities for like-minded people. She is currently a writer for Sony ATV, has a degree in classical guitar, is running her own record label, and writing music for a play in NYC, baby! Shanna Watson is a Melbourne based multi instrumentalist, songwriter and gardening enthusiast. Currently performing with Handsome, Grace Turner, S.M Jenkins and Ella Hooper, Shan has toured nationally and overseas, written and produced a bunch of studio releases and supported a long list of acclaimed artists. Ellie is a trombonist, vocalist, arranger and composer who has been performing regularly with a number of different projects in and around Melbourne for almost ten years. Ellie completed a Bachelor of Music Performance at Monash University, and now fronts her own trad jazz band Jam Jar as well as being a member of Blue Rose, Quadrifid, and SPIRE Ensemble among other projects. In 2018 she played with Gang of Youths on MTV Unplugged Melbourne.